At less than 100 lbs and featuring built-in handles, ramp and wheels, Cardinal’s American-made Run-A-Weigh portable scale is easily lifted and moved wherever you need it. A wide 24.5 x 30 inch (62.3 x 76.2 cm) platform makes weighing barrels, drums and small crates a breeze. Setup is quick and simple with self-aligning feet. Models available in painted mild steel with 204 digital indicator or stainless steel with 190 digital indicator, or standalone (no indicator at all). Available in capacities of 500 or 1,000 lbs. 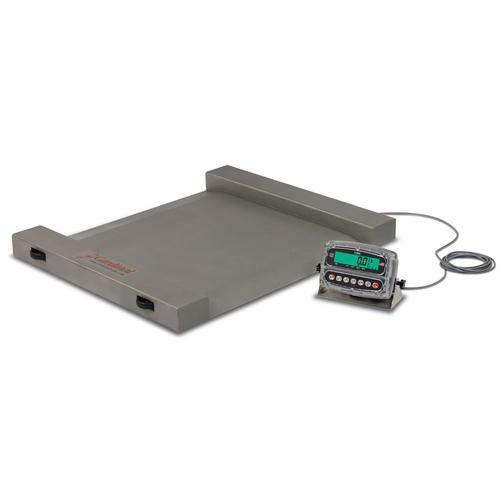 The Run-a-Weigh portable floor scale features a spacious 24.5 x 30 inch (62 x 76 cm) platform with two-way, easy-access integral ramps, built-in handles and wheels, battery power option, plus a lightweight 95 lb (43 kg) frame for easy mobility and use in multiple locations. The Run-a-Weigh easily fits through standard doors and can go wherever you need it for weighing drums, barrels, industrial containers, and small crates. The ultra-low, 2.2-inch-high profile allows easy loading of heavy items. It is available in a heavy-duty checkered mild steel deck with 500 lb x 0.2 lb / 225 kg x 0.1 kg or 1,000 lb x 0.5 lb / 450 kg x 0.2 kg capacity.